Today, I slept in till 7:30am, had breakfast with Akbar, and then did laundry. Afterwards, I prepared my backpack for tomorrow’s climb to Camp I. I intend to climb to Camp I, sleep there, then climb to and establish camp II, sleep there, then descend on Thursday early in the morning directly to Base Camp before the storm that’s forecast to hit in the afternoon arrives. After this, the weather is forecast to be bad till next week, giving me plenty of time to rest and recover in base camp. I will aim to leave base camp by 2:30am. 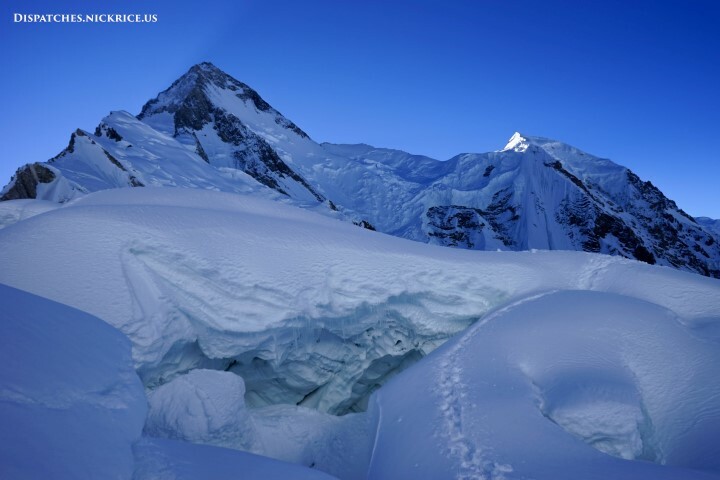 Dawn on the Gasherbrum glacier with a massive shadow cast by Gasherbrum I which protected the snow bridges that I must cross when descending through the ice fall. Today, after not being able to sleep past midnight due to the cold, I began preparing my things for the descent to base camp around 4:00am. I melted some snow for water and had a small breakfast cookie, emerged from my tent, ensured that it was well secured, and began my descent solo to base camp. The sun and the moon were both out and I was pleased to have 15 minutes of sun while crossing the glacier before descending back into the shadows cast by the massive peaks around me. I walked very quickly so as to minimize the amount of time that I was climbing over snow bridges once the sun hit the glacier. 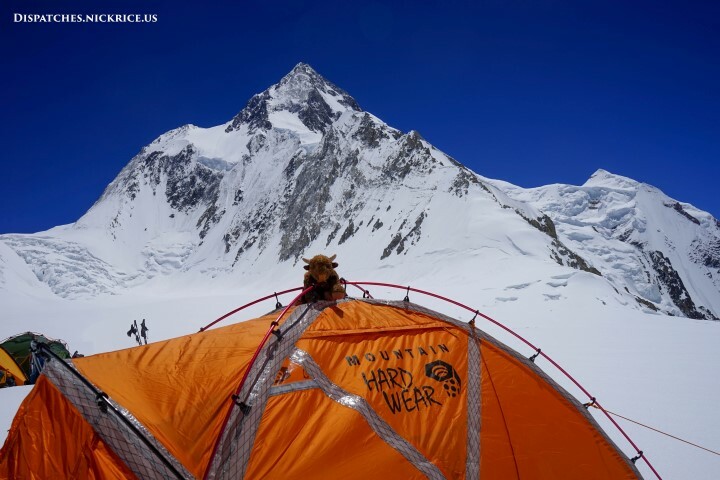 I arrived to base camp less than three hours after leaving Camp I. I immediately asked Akbar for breakfast and tea and unpacked my equipment so that it could dry in the sun. After eating, I showered and began feeling human again. It’s amazing how a night alone in a tent in subzero temperatures can change your perspective. When I arrived to base camp on the trek, I thought that it was always either too hot or too cold and quite uncomfortable. However, while descending from Camp I, I was dreaming of my cozy sleeping bag in my warm base camp tent and Akbar’s cooking. This is one of the things I love about climbing in the high mountains. It returns one’s gratitude for things that we take for granted in our everyday lives. Even the luxury of the toilet tent in base camp was a welcome change from squatting on a windy cold glacier with absolutely no privacy. The complete deprivation of all but the most essential survival items reminds me how lucky I am to have even the most basic of luxuries at home (and reminds me that they are in fact luxuries and that not everyone in the world is afforded them). After lunch, I studied my MCAT biology/biochemistry book for a few hours and worked on charging all of my communications equipment. 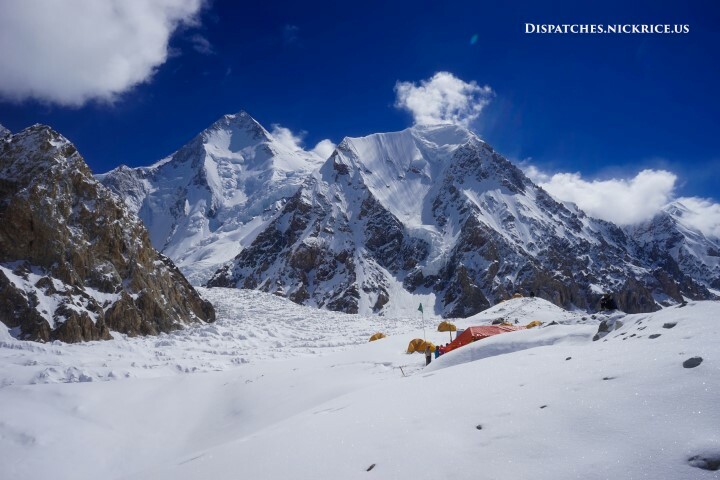 I will take at least tomorrow as a rest day before attempting to establish camp II at roughly 6400m/20,997ft in the shoulder between Gasherbrum I and Gasherbrum II. My schedule will of course depend on weather conditions. I have heard that a summit window will appear from July 20th-26th which coincides with most years. Therefore, my goal will be to be acclimated and rested before this window so that I may make a summit attempt. Today, I woke up at 2am, packed up my things, and ate a quick but filling breakfast. The night was clear with a light breeze and a full moon made my headlamp unnecessary (thankfully, since it stopped working about two hours into the climb; I brought a spare after what happened last year on Broad Peak). At 3:30am, I headed up the glacial moraine to the start of the route and quickly made my way through the lower ice fall. I caught up with the Taiwanese and Spanish groups and continued on toward the second ice fall. The route to Camp I felt longer than I remember from 2006 and veered west to avoid some large crevasses before correcting east to arrive to Camp I. Since this was my first climb to Camp I, I was loaded down with 30kg of equipment, and the climb took close to seven hours (I arrived at 10:30am). Camp I is around 900m higher than base camp, so we were all quite exhausted when arriving. 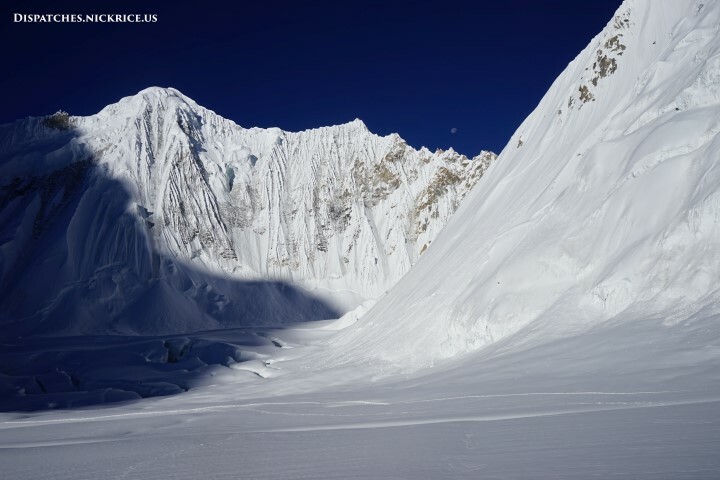 The camp is situated on a glacier in a valley surrounded on all sides by massive snowy peaks. This limits the amount of wind that arrives and also magnifies the intensity of the sun. Inside the tent was miserably hot, however, after climbing all morning in the sun, I was far too sunburned to spend any more time outside. I suffered quietly in my tent all afternoon. I ate and drank as much as I could and around 5pm, the sun dipped behind Gasherbrum IV and the temperature dropped to sub-zero in a matter of minutes. I radioed base camp to let Akbar know my plans and then made dinner. My lightweight sleeping bag was no match for the cold and I spent a miserable night in Camp I, waking up around midnight to boil some water to put in a bottle in my sleeping bag. Today, I woke up at 7:30am, had breakfast with Akbar, and got to work packing my equipment for a night at camp I. Afterwards, I went up to Kinga’s camp where they were moving their base camp higher up the glacier. I spoke with the group about their plans and then returned to my camp where I reorganized my base camp tent so that it wouldn’t leak on me in the night. Akbar worked all afternoon on the shower tent so I was finally able to shower for the first time since Paiju six days ago. Afterwards, the liaison officer asked everyone who’s going up to Camp I to come up for a group picture. We spoke at length about our plans and afterwards, I visited with the Taiwanese who are also going up to Camp I tomorrow morning leaving around 3am. 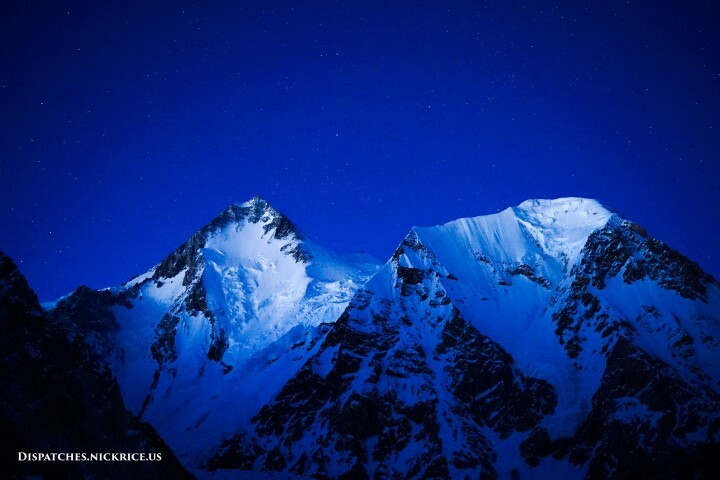 I returned to my camp to finalize preparations for the climb and to have dinner. I will wake up at 2am, have breakfast at 2:30am, and leave base camp for Camp I at 3:00am. The early hour is to ensure that the snow is as hard as possible to minimize chances of punching through a delicate snow bridge over one of the many massive crevasses that riddle the route to Camp I. Today, I woke up at 7:00am and had breakfast in the kitchen tent with Akbar and Fida. Afterwards, we got to work setting up base camp. The calm of base camp was interrupted by the frequent arrival of helicopters for the army camp. More than a dozen flew by base camp today. In the afternoon, I struggled to get my communications equipment working and in the evening, Akbar and I worked out a few electrical problems. When all was said and done, the mess tent was the best I’ve ever seen. It has an insulated floor, carpet, liner walls to keep it warm and colorful decorations. In the evening, I had dinner in the newly constructed mess tent and then talked for a while with Akbar. Tonight, Fida will leave to join another expedition for the trek. For the next seven or so days, it will just be me and Akbar in our base camp. Afterwards, Manzoor and the Austrian climber will join us. 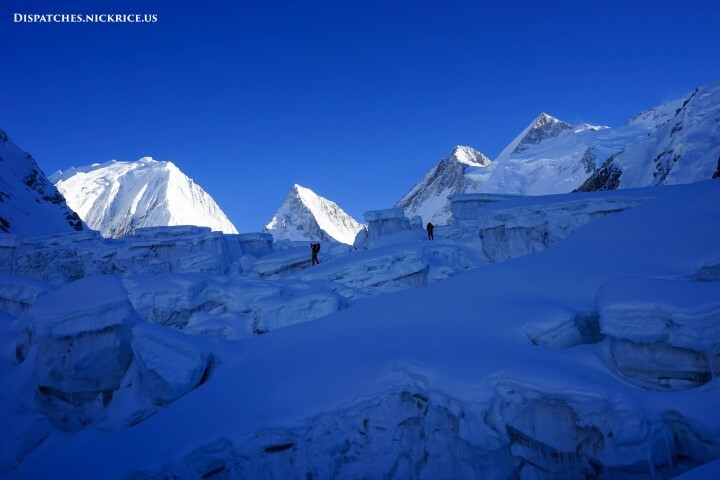 Kinga, Ferran, Yannick, and Tom arrived to base camp in the early afternoon. I will visit with them tomorrow to discuss plans for the mountain.